Frame: SuperSix EVO Women's, BallisTec Carbon, Di2 Compatible, SAVE, PressFit BB30. Fork: SuperSix EVO, BallisTec Carbon, SAVE, integrated crown race, 1-1/8" to 1-1/4" steerer. Rims: Cannondale HollowGram Si, Carbon Clincher, 35mm deep, 17mm inner width. Hubs: Cannondale HollowGram Sealed Bearing. Tires: Vittoria Rubino Pro Speed, 700 x 25c. Crank: Cannondale HollowGram Si, BB30a w/ Power2Max NG Eco Power Meter and FSA rings, 50/34. Cassette: Shimano 105 7000, 11-30, 11-speed. Front Derailleur: Shimano Ultegra, braze-on. 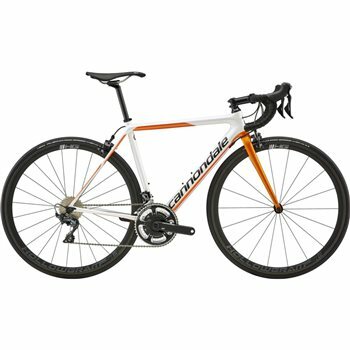 Handlebar: Cannondale C1 Ultralight, 7050 Alloy, Compact. Stem: Cannondale C1 Ultralight, 7050 Alloy, 31.8, 7°, Integrated Garmin mount. Headset: SuperSix EVO, 1-1/4" lower bearing, 25mm Alloy top cap. Saddle: Fabric Line Shallow Race 142mm, ti rails. Seatpost: Cannondale C2, UD Carbon, 25.4 x 350mm. Extras: Power2Max NG Eco upgradeable power meter - ready to activate.